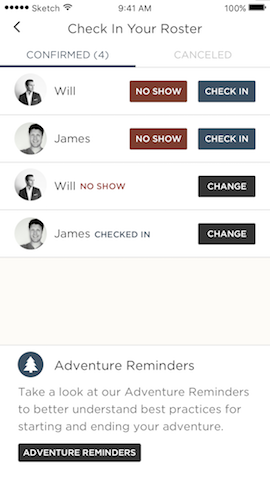 Check in your participants before you cover the overview of your adventure with the group. To start the check in process go to session clipboard > upcoming session > roster > confirm who is here or a no show. This ensures everyone who signed up is accounted for. Check out the screen below to see what the check in looks like on the app. Ensure your participants book your adventure through the app. Not all people will understand the purpose of booking your session through the app. Below are some canned responses to encourage people to download and sign up for your adventure. "Not enough room on my phone - out of storage" - Can you delete another app on your phone to free up some space? Just until the adventure ends. "The app isn't working" - Contact customer support through the in-app messanger and they will take your information. What's the point of the app if I already know where the meet up location is? For participants to sign the booking agreement and liability waiver. To ensure participants are covered by Adventure Aide insurance if anything happens. Enables you as the Aide to message participants directly for any upcoming sessions. Aide earns post adventure ratings and reviews. Keeps a record of your total bookings and connections made. What to consider before the start of your adventure. "Hey, my name is Jerry and I’ll be your Aide for the day. I am an avid hiker and have been living in Santa Barbara for 10 years, exploring all the trails along the Central Coast. I love hiking because it’s so accessible and it’s a great way to get outside and enjoy the fresh air." Provide a general overview of the adventure, covering details such as: how long the adventure will take, how many participants joining, and an overview of the environment (wave/trail/rock conditions), and any other elements of your adventure. Some people may need more attention and information than others. Make sure to identify any first timers who have never experienced your type of activity. Check out an example below. Whether you’re leading a surf lesson, bouldering demo or an MTB ride, make sure you educate your participants on the basic skills needed for your adventure and how each piece of equipment works. Set your participants up for success by communicating early and often. Let your participants know they are covered by Adventure Aide's insurance in case they are injured while on your adventure. Check out the Aide insurance policy below. Trust me - "I’m here to help and make sure things run smoothly and safely"
Be vocal - "Let me know of any discomforts, injuries, or precautions"
Show respect - "Be mindful of others and the natural surroundings"
Have fun! - "Enjoy the fresh air and introduce yourself to the rest of the group."